A group of researchers at Brown University have demonstrated a new way to fabricate super-crumpled and super-wrinkled sheets of graphene. Graphene is a nanomaterial that exhibits interesting properties. The study reveals that topography can boost some of the unique properties of graphene. Engineers at Brown University performed the study, which revealed that graphene, when crumpled and wrinkled in a multi-step procedure, becomes considerably better at repelling water. This feature could be used to make self-cleaning surfaces. 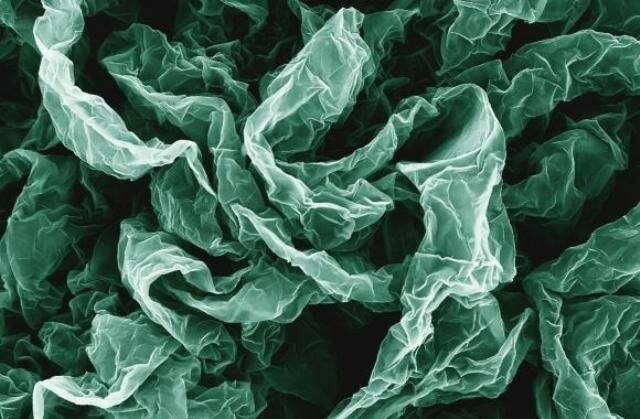 Improved electrochemical properties are exhibited by crumpled grapheme, allowing the material to function as electrodes in fuel cells and batteries. The results of the study have been reported in the Advanced Materials journal. The latest study adds to the previous work performed by Ian Wong and Robert Hurt from Brown’s School of Engineering. Earlier, the team had demonstrated that it could make substrates to grow cells, which resemble the complex environments, where cells grow in the body. This can be done by introducing wrinkles within the graphene. Headed by Po-Yen Chen, a Hibbit postdoctoral fellow, the researchers wanted to add more complicated architectures by including both crumples and wrinkles. I wanted to see if there was a way to create higher-generational structures. In order to achieve that, the team deposited graphene oxide layers onto shrink films, which are polymer membranes that reduce in size when exposed to heat. The graphene on top is packed together, allowing it to crumple and wrinkle as the films shrink. In order to view the type of structures that could be created, the same sheets of graphene were compressed several times. The film dissolves following the first shrink, and the grapheme is placed in a new film so that it shrinks again. Various configurations were tried out in the following generations of shrinking. For instance, the films opposite ends were clamped together, causing the films to shrink only along a single axis. Clamped films resulted in graphene sheets with periodic wrinkles across its surface, while unclamped films shrank in two dimensions, length- and width-wise, producing a graphene surface crumpled in arbitrary shapes. The researchers conducted experiments with different shrinking modes over three consecutive generations. For instance, the same sheet of graphene may be reduced on a clamped film, followed on an unclamped film, and then clamped again; or alternatively in unclamped, clamped, and unclamped pattern. The graphene was also rotated in various configurations between shrinkings, and by positioning the graphene sheet in a perpendicular direction to its original orientation. The researchers observed that the multi-generational method could significantly compress the sheets of graphene and make them as tiny as one-fortieth of their actual size. They also demonstrated that the consecutive generations could produce fascinating patterns along the surface, such as crumples and wrinkles that were superimposed on each other. As you go deeper into the generations you tend to get larger wavelength structures with the original, smaller wavelength structure from earlier generations built into them. For instance, a sheet that was shrunk clamped, unclamped, and then clamped was not similar to a sheet that was unclamped, clamped, and unclamped. The sequence matters. It’s not like multiplication where 2 times 3 is the same as 3 times 2. The material has a ‘memory’ and we get different results when we wrinkle or crumple in a different order. The team created a type of taxonomy of structures that were born from various configurations of shrinking. Multiple structures of those were tested to identify how they changed the properties of the graphene sheets. The researchers showed that it is possible for a highly crumpled graphene surface to become superhydrophobic, which means it can resist becoming wet by water. Water beads up and rolls off as soon as it touches a hydrophobic surface. A material is considered to be superhydrophobic when the water beads’ contact angle with an underlying surface crosses 160 degrees. In other words, only a small quantity of water bead’s surface actually touches the material. The group proved that superhydrophic graphene can be made with three unclamped shrinks. The researchers also demonstrated the graphene’s electrochemical behaviours can be improved through crumpling. This could be useful in the generation and storage of energy. The study also revealed that when used as a battery electrode, crumpled graphene had as much as 400% higher electrochemical current density over that of flat graphene sheets. That higher current density could be used for making highly efficient batteries. You don’t need a new material to do it. You just need to crumple the graphene. Besides water-resistant coatings and batteries, graphene that is compressed accordingly could be used in stretchable electronics, for example, a wearable sensor. The researchers will explore various ways of producing structures on other nanomaterials, including graphene. There are many new two-dimensional nanomaterials that have interesting properties, not just graphene. So other materials or combinations of materials may also organize into interesting structures with unexpected functionalities. The research was funded by a Brown University seed grant. The Hibbit Engineering Fellows Program, which supports outstanding postdoctoral researchers as they move to an independent career, supported Po-Yen Chen. Co-authors of the paper were Jaskiranjeet Sodhi, Thomas M. Valentin, Dr. Yang Qiu, Dr. Zhongying Wang, and Ruben Sptiz Steinberg.